Green. . . The word itself may becoming a touch hackneyed, but interest in enviro-friendly packaging solutions is fresher than ever. Timeously coming to market in a joint venture that will open a myriad of new green packaging possibilities for local FMCG companies is Sappi Enviropack, as Brenda Neall reports. AMOTZ Golan of AGQPE has been a foot soldier for green packaging in South Africa for over four years now. A veteran entrepreneur and blessed with a sharp eye for opportunities, Amotz has long held that packaging, because it’s such a prominent target, will be pressed more than most industries to get its eco-credentials in consumer and regulatory order. ‘Green packaging is the future!’ he states simply. With this mantra in his pocket, he headed to Asia several years ago and set up an alliance with Greener Solutions, a Hong Kong-based trading house, devoted to green packaging, which has links with converters in mainland China, all using sugar-cane bagasse (the remaining fibre after sugar has been extracted from harvested cane) as their raw material. The upshot was the establishment in 2008 of a new subsidiary to his AGQPE business, Enviropack, and the slow and steady penetration of the South African market, especially the fast food and frozen ready meal sectors, with an extensive range of fully biodegradable, bagasse-board containers. Notable early takers have been Nando’s Peri Deli and Fry’s Foods, the go-getting KZN-based vegetarian foods producer. Passionate and evangelical about Enviropack’s inventory, Amotz realised the range would hold a great deal more cachet if it had the backing of an industry giant, and bore a ‘Made in SA’ tag – and thus he began talking to Sappi, international pulp and paper manufacturer, and also the owner of a factory in Stanger that makes paper and board almost entirely from sugar-cane bagasse. His overtures were welcomed – this market was prominent on Sappi’s radar, and also met its vision of ‘forward integration’ ie extending the Sappi brand into packaging end products. 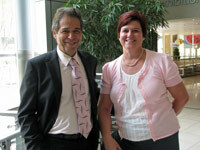 Intending to take green packaging where it has never been before in SA: Amotz Golan, MD of ENVIROPACK and Tessa Hattingh, Product Development Manager: Paper and Paper Packaging at Sappi – new joint venture partners in Sappi Enviropack. In late 2009, Enviropack and Sappi signed an initial agreement leading to full co-operation, and during the intervening year set about exploring the way forward with viability studies, market research and production trials. The upshot, announced here and to be launched on a public platform at the Hostex expo in Jo’burg in mid-March, is the official début of a new, trademarked entity, Sappi-Enviropack. Tessa Hattingh, product development manager: Sappi Paper & Paper Packaging, is ebullient about a project she has driven, with the full backing of her management, and which has filled her working day for over a year. ‘This joint venture utilises the best resources of both companies. Amotz has done extensive ground work in developing the market, and without having to reinvent the wheel, we can now offer FMCG packaging markets a viable environmental alternative that has previously been imported,’ she comments. Added to this, they’re non-toxic (even when burnt), water-proof, oil-resistant, strong, static free, shock absorbent, food-safe, ovenable to 220°C, microwavable and freezable. ‘Our containers are made to the highest hygiene, food safety and manufacturing standards, and all come with appropriate certification tickets such as ISO 9001, HACCP, GMP and BRC among others,’ he stresses. The packs also tote a DIN CERTCO registration number (from the German independent certifying institute) which certifies their compostability. Sappi-Enviropack will be priced competitively with the likes of APET and CPET, and bigger volume runs will be even more cost effective. ‘Our positioning is not premised on price and we’re not looking to compete with foamo (EPS) trays, for instance. Our packaging is about environmental responsibility, credibility and integrity; plus the fact that we’re manufacturing the packaging in South Africa,’ he insists. Amotz, supported by colleague, Michelle Michielin, has been preaching his green wares to prominent food manufacturers, retailers and fast-food companies; and food applications – trays, clam shells, sandwich packs, punnets, beverage cups and so on – are currently Sappi-Enviropack’s most obvious and biggest target. But, Amotz adds, there are ‘unlimited possibilities’ for the likes of cushioning packaging, especially for sensitive electronic equipment and fragile items; for horticultural products such as seed trays and pots; and even disposable medical products (bed pans, urinals, etc). An attractive, natural beige-hue, packs can be printed on their smooth-wall side and they can also be embossed. Several lidding options are available from AGQPE, including compostable film, and trays can be sealed on existing heat-sealing machines. Flexibility will be a Sappi-Enviropack watchword, and while a line of stock items will be available (for export markets, as well), proprietary pack designs will be in affordable reach for appropriate volumes. Sappi, too, says Tessa, views this as a notable and promising development for the group: ‘We’re extremely proud to be able to offer the packaging sectors a competitive, proudly South African and genuinely green packaging solution,’ she concludes. Rapid growth of the sugar cane plant means that this is a sustainable and renewable resource. Clears the waste created from sugar refining. For every two tons of sugar refined, two tons of bagasse is left behind. It is a truly renewable resource and a far superior alternative to petroleum-derived products. Confirmed life cycle from organic material to organic material. 100% compostable and bio-degrades in 30-180 days. 100% food safe and non-toxic.